Over the past decades palm oil has become the first source of vegetable oil in the world. With an annual production of more than 50 million tons it exceeds by far all other vegetable oils. The growth in the sector is mainly due to two Southeast Asian countries, followed by Nigeria, Ghana and Cameroon in Africa, and Colombia, Ecuador and Brazil in South America. The tremendous growth of the palm oil sector was driven by an increasing demand for vegetable oil due to the global population growth, an increase of fat consumption per capita due to better living conditions in quickly developing economies like China and India, and an increasing market share due to more competitive prices. 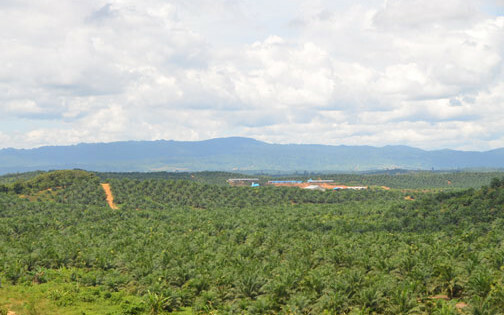 This proposed Sentinel Landscape consists of a collection of landscapes which are linked to a global market chain and investment flows associated with oil palm development. The main focus will be to assess the socio-ecological transformations in specific landscapes which are influenced by oil palm development. 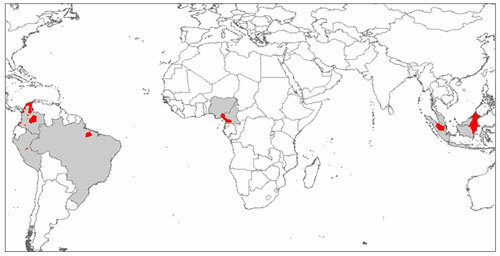 This Sentinel Landscape consists of a collection of landscapes which are linked to a global market chain and investment flows associated with oil palm development. The main goals of this Sentinel Landscapes is to improve our understanding, with a comparative perspective, about the main socio-ecological transformations underway in specific landscapes associated to the development of a global palm oil value chain. We argue that some important differences exist in at least three aspects: 1) the land use change trajectories resulting from oil palm development since oil palm plays a different role depending on the stages of agrarian and forest transition in specific landscapes, 2) the distribution of economic benefits since oil palm plays a different role in economic growth and people’s livelihoods depending on the adoption of different business models related to corporate strategies and existing policy incentives, and 3) the effectiveness of policy and market-based instruments to regulate oil palm expansion that depend on broader institutional conditions. In-depth understanding about the different trajectories of oil palm development and their impacts can contribute to more effective decision-making on ways to ameliorate the negative socio-environmental impacts of oil palm, and enhance the positive ones. What is the role that oil palm expansion has on local and national models of economic development and what are the associated impacts on land use change trajectories? What is the role of state policies vis-à-vis corporate strategies in the adoption of business models and production networks under diverse political economy contexts? 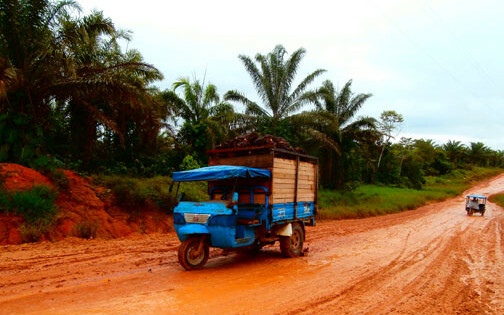 Under what investment and business models can oil palm contribute to achieve better impacts for poverty reduction while resulting in lower impacts on forest conversion? What mechanisms are more effective to reduce the negative impacts, and to promote more sustainable and inclusive business models of oil palm production? Are the costs of complying with these mechanisms excluding to smallholder oil palm production? Several specific geographies where oil palm is expanding have been selected in seven countries, including Sumatra and East Kalimantan in Indonesia, Sabah in Malaysia, southeastern Nigeria, Cameroonian oil palm belt in southwestern Cameroon, northeast of Para State in Brazil, San Martin and Ucayali in Peru, and oil palm provinces in Colombia in three zones (north, center and east) (see Figure 1). Figure 1. Selected sites in the Oil Palm Sentinel Landscape, CRP-FTA Program. A significant expansion of oil palm has taken place in the landscapes in Indonesia and Malaysia, which has been driven by large-scale plantations but with a growing involvement of smallholders over time. While oil palm is traditionally part of the agricultural systems of smallholders in the landscapes in Nigeria and Cameroon, oil palm plantations are expanding increasingly driven by local elites and the arrival of foreign large-scale investors. Oil palm plantations are relatively well developed in Colombia, with larger expansion in the Llanos Orientales, which is driven by medium-scale domestic investors, yet alliances with smallholders are becoming more important. 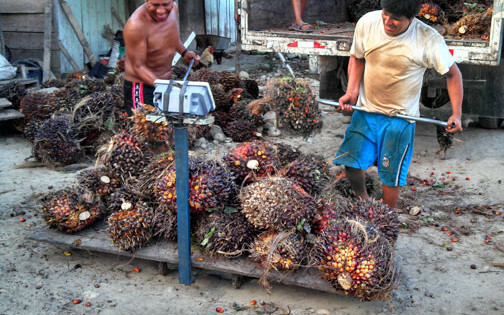 In Peru, smallholder cooperatives constitute important actors in oil palm expansion along with a few industrial groups. In Brazil, oil palm expands due to few large- and medium-scale companies, and integration of smallholders in the business is still slow. Main available spatial and statistical information has been collected with regard to oil palm development in the different countries comprised by the Oil Palm Sentinel Landscapes. Information has covered four main different areas of interests which are: biophysical attributes of the landscape (e.g. soils, temperature, vegetation); land use and land tenure (including deforestation trends); production and processing (e.g. volume, prices, processing capacity, markets); and infrastructure (e.g. roads, mills). We are still in process of systematizing this information, which is relatively uneven depending of the country. More complete statistical datasets are available for Indonesia, Malaysia, and Colombia. Data at the household level has been collected through fieldwork undertaken in three locations in Colombia (north, center and east), San Martin and Ucayali in Peru and two locales in Eastern Sabah, Malaysia (Lormalong and Apas Balung). 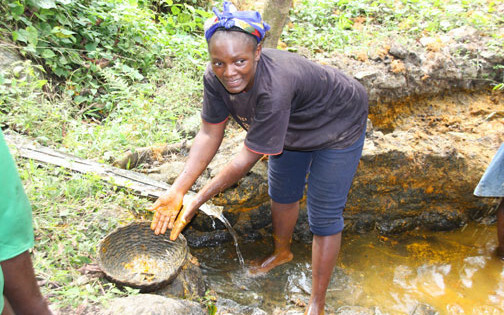 In Cameroon, household data has been collected in four major palm oil producing basins: Eseka, Dibombari, Muyuka, and Mundemba-Lobe. Additional data is being collected among independent smallholders in the Sanaga Maritime. Additional data is still in process of being collected in East Kalimantan (Berau district) and West Kalimantan (Kapuas Hulu) in Indonesia. Primary data collection has been carried out with the use of a standardized protocol that was designed for this purpose, while this has been adjusted to the local realities in each landscape. The questionnaire used include requests for information on household demography, land assets and land use, oil palm production and labor, farm and domestic assets, income and remittances, credit, planting materials, and perceptions about oil palm. Additional qualitative information has been collected in all the different mentioned locales through the use of focus groups, and interviews to key informants.